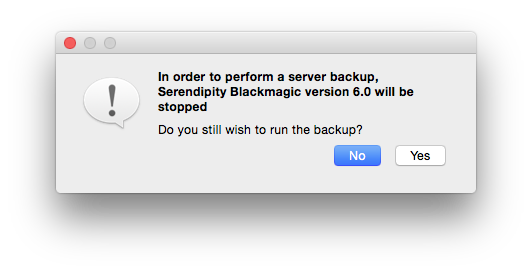 Serendipity Blackmagic / Megarip / Veripress 6.0+ include Client and Server Backup/Restore functions in addition to standard database backup. 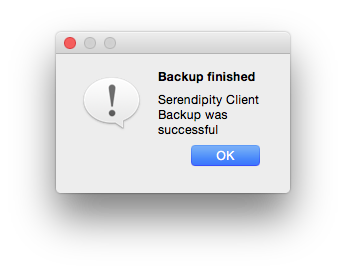 The Serendipity Client and Server applications are able to be completely backed-up via Help menu options. Used in conjunction with the Archives application, this feature allows users to create a complete and thorough backup of all configurations in the event of a hardware or software failure. A Server backup, when performed, will create a complete backup of all Server Settings and preferences, the entire Workbench database and all ICC profiles. A file window will pop-up. 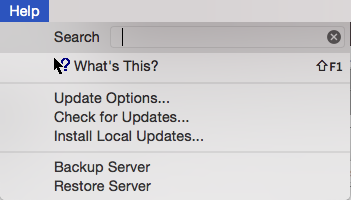 Navigate to your desired file location, name the .backup file, then click Save. Click OK then restart the Server. A second dialog will pop-up stating the Server needs to shut down in order to perform the Restore. Click Yes to proceed. A file window will open. 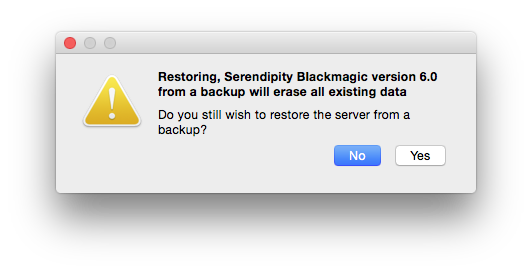 Navigate to the server .backup file, then click Open to Restore from the backup. IMPORTANT – As stated in the pop-up warning dialog (above), Restoring a Server Backup will erase ALL existing database and server settings data. If anything has been added to the Workbench database since the last Server Backup, you may wish to save the recent items to a (.sdb) archive using the Archives application. A Client backup, when performed, will create a backup of all Client Preferences settings, layouts and Workbench Items list folders. This includes currently open Client windows (along with their size and desktop placement), Jobs tabs, QueueManager preferences and sort column order, QueueStatus printer selections, DropSpots, etc. NOTE- It does not backup Workbench database items or ICC profiles. 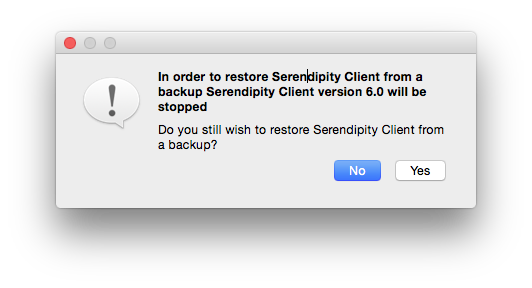 A second dialog will pop-up stating the Client needs to shut down in order to perform the Restore. A file window will open. 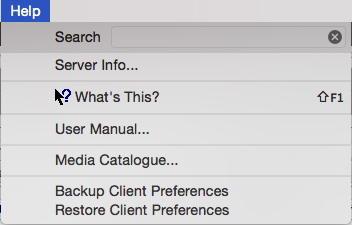 Navigate to the client .backup file, then click Open to Restore from the backup. click OK then restart the Client. Another practical use for a Client Backup is to create a standardised user experience for multiple users connecting to the same Server via stand-alone Clients. Restore the Client Preferences to each Client. This entry was posted in Blackmagic, HowTo, Megarip, Serendipity Client, Veripress and tagged Version 6.0+. Bookmark the permalink.